A couple of weeks ago, I went to Pampanga and exited at one of the reststops located along the North Luzon Expressway stretch. 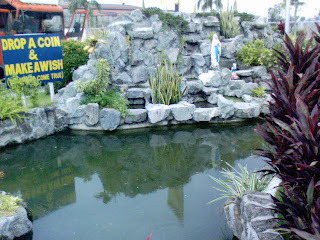 After taking a break, I noticed that there was a small pond near the other side of the parking lot. Exemplifying the usual exploring tourist, I went there to take a picture. From afar, I saw the sign "drop a coin, make a wish" which got me excited. When I got there, I saw this murky, greenish colored water. It must have been filled with lots of moss underneath that you couldn't see any coins on the pond's floor. If there were any fish here before, I'm sure their skeletons can be retrieved by CSI on the bottom floor. I wonder if your wish counts if you toss it into a dirty wishing pond. 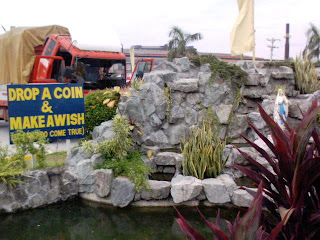 But I did anyway... tossed 3 25 centavo coins and a one peso coin. "That someone have mercy and clean this pond". saan po ito sa pampangga?? san PO ito sa PAmpanga? It's along NLEX, along the way to San Fernando. Right side if you're coming from Balintawak heading north.